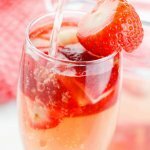 A fresh update on a traditional brunch cocktail, this Strawberry Shortcake Bellini is perfectly pretty and oh-so-refreshing! Combine vodka and sparkling rose in a large pitcher with ice. Take care pouring the rose to prevent it from foaming up over the top of the pitcher. (For a sweeter cocktail, add 1/4 cup strawberry puree). Add sliced strawberries to pitcher, stir to chill. Pour into champagne flutes and garnish with fresh strawberries.